Are you tired of waking up in the morning after a restless night of tossing and turning? If your joints are sore every day, and your back needs constant cracking, you may need a memory foam mattress. Memory foam mattresses reduce the likelihood of tossing and turning while you sleep. The unique material conforms to the line of your body, allowing you to sink into the mattress and relieving strain on pressure points. Most people consider sleeping on a memory foam mattress to be like sleeping on a cloud. But choosing a memory foam mattress can be a chore. If you’ve never slept on one before, you might not even know what to look for in a memory foam mattress. The best memory foam mattresses will be thick, offer multiple layers of varying materials, and reduce heat build-up while you sleep. Memory foam mattresses come in a number of sizes and thicknesses, and you’ll need to find one that fits your needs. 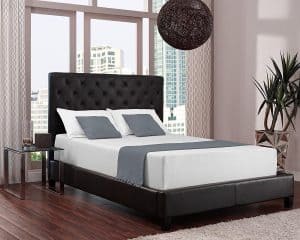 Below our memory foam mattress reviews, refer to our Buyer’s Guide to better understand what specifications will be most relevant in your search for the best memory foam mattress. Read our FAQ to make the most informed choice about which model will work best for you! 1. Did NASA invent memory foam? 2. How is memory foam made? 3. How are memory foam mattresses shipped? 4. Are all memory foam mattresses hypoallergenic? 5. What are the risks involved with memory foam? 6. What are Certipur-US® standards? 7. Can memory foam help reduce chronic pain? The Zinus Sleep Master Ultima Comfort Memory Foam 8 Inch Mattress includes three layers of memory foam in varying densities. This model from Zinus even utilizes natural plant oil to replace some of the petroleum to keep the mattress fresh. At 8 inches thick, the Zinus may not be the thickest memory foam mattress on the market, but it doesn’t sacrifice your comfort. The three layers of memory foam work together to conform to your shape and to support you from beneath, offering you a cozy and comfortable night’s sleep. In terms of value, the Zinus is one of the most cost-effective mattresses on the market. If you’re looking to upgrade on a budget, the Sleep Master Ultima is a great mattress to investigate. However, some consumers report that the mattress loses its firmness after a few months, deflating almost like an air mattress. Others report a nauseating smell that fills the bedroom. The Zinus Sleep Master Ultima Comfort Memory Foam 8 Inch Mattress is a great choice if you’re buying on a budget. Its eco-friendly materials and plant oil additives reduce the usual smell of memory foam mattresses, and its layers of memory foam work together to give you a great night of sleep. This mattress is one of the most cost-effective, and though it may lose its firmness after a few months, this offering from Zinus is a great way to test whether memory foam is appropriate for you. The Zinus Memory Foam 12 Inch Green Tea Mattress includes four layers of memory foam in a 12-inch thick mattress. Most layers are infused with a green tea extract and natural seed oil to reduce odors and bacteria. The first layer is three inches thick and made of memory foam. The second layer is two inches thick and made of comfort foam. The third layer is almost four inches thick and made of high-density, ventilated foam. The fourth layer serves as the base of the mattress. It is 3.5 inches thick and made of more high-density, ventilated foam. The foam is free of flame retardants, ozone depleters, mercury, formaldehyde, lead, heavy metals, and other dangerous materials sometimes found in other memory foam mattresses. The Zinus mattress is made with low VOC certified foam. However, some consumers report that the Zinus does not fully decompress. After a year of use, it may sag or develop permanent indentations. The Zinus Memory Foam 12 Inch Green Tea Mattress smells better than most memory foam mattresses thanks to the green tea extract and natural seed oil additives. The mattress is 12 inches thick and uses four layers of memory foam to make you comfortable. Though the mattress may not fully decompress when it arrives, the memory foam is eco-friendly and free of any dangerous materials. The Classic Brands Cool Gel Ultimate Gel Memory Foam 14-Inch Mattress is one of the thickest memory foam mattresses on the market. Its multiple layers of foam and gel provide support and comfort while prioritizing breathability. The gel memory foam conforms to your body and recovers faster than traditional memory foam. The gel is more porous than conventional foam, allowing air to travel more easily through the mattress. If you’re worried about overheating on a memory foam mattress, this offering from Classic Brands should help keep you cool. This memory foam mattress is hypoallergenic and resists allergens, mold, bacteria, and dust mites. The mattress ships with a knit cover that maximizes the breathability of the cool gel foam. The knit fabric optimizes airflow and conforms to your body along with the mattress. However, some consumers suggest that the Classic Brands mattress is too firm and never conforms to the sleeper. The high density of the foam makes the bed feel harder than others. Layer of gel foam keeps you cool. 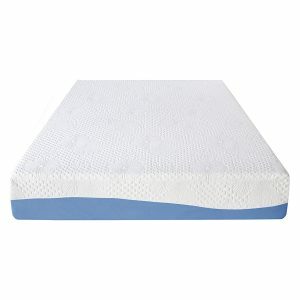 The Classic Brands Cool Gel Ultimate Gel Memory Foam 14-Inch Mattress is one of the higher-quality mattresses reviewed here. It is also the thickest mattress on this list. If you’re most concerned about comfort and quality, the Classic Brands mattress is worth a look. Its hypoallergenic materials and high-density foam make this mattress less prone to sagging than others. Its gel-infused layer of foam keeps you cool. 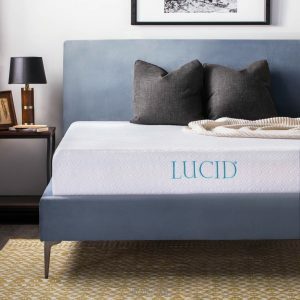 The LUCID 12 Inch Gel Memory Foam Mattress combines layers of gel-infused memory foam with high-density memory foam to offer an untroubled night’s sleep. The ventilated gel foam optimizes the flow of air, making this mattress a cooler option than some others that retain heat. The top gel layer prevents heat buildup. The middle layer of memory foam is one inch thick and infused with bamboo charcoal to help with ventilation. The bottom layer of the mattress consists of eight inches of high-density memory foam, which supports your weight as you sleep. The “open cell” structure of the LUCID gel memory foam mattress also makes this model last longer than others. A breathable cover made of a polyester blend adds softness and moisture-wicking comfort. The LUCID also comes with an impressive 25-year warranty against manufacturer defect, which lends a certain confidence as to its quality and long-term sustainability. However, some consumers report that the mattress tends to sag or “deflate” beneath heavier sleepers. After a year or two, the mattress may develop divots or permanent indentations. The LUCID 12 Inch Gel Memory Foam Mattress comes with a 25-year warranty against manufacturer defect, ensuring durability and quality. At 12-inches-thick, this mattress from LUCID combines comfort with sustainability. Natural additives like bamboo charcoal help with ventilation and reduce odors. A top layer of ventilated gel increases comfort while preventing temperature increases while you sleep. If you’re looking for a memory foam mattress with guaranteed quality, this is a great option to investigate. The Zinus Memory Foam 12 Inch / Premium / Ultra Plush / Cloud-like Mattress offers five layers of fabric and foam—all manufactured specifically for your comfort. At 12 inches thick, this is one of the thicker mattresses available, and that level of comfort is impressive for a full-sized mattress. This offering from Zinus comes with a plush, quilted cover that looks similar to the outer layers of innerspring mattresses. But aside from its beautiful quilting, the cover offers an extra layer of comfort. Unlike other memory foam mattresses, this model includes a layer of quick-response foam beneath the quilt, making it easy for the mattress to conform to your body. However, consumers report that the removable knitted cover cannot be put back on the mattress once it’s been removed. This mattress is also smaller than some of the others reviewed here. Six layers of fabric and foam. Knitted cover difficult to put back on mattress. 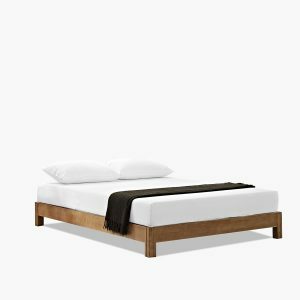 The Zinus Memory Foam 12 Inch / Premium / Ultra Plush / Cloud-like Mattress offers more layers of foam and fabric than any of the other mattresses reviewed here on this list. At 12 inches thick, it’s a bargain in terms of comfort and range. The top layer even includes quick-response foam, ensuring that the mattress conforms easily to the shape of your body. Though this may not be ideal for two sleepers, and the knitted cover isn’t as removable as advertised, this offering from Zinus might be a solid choice. 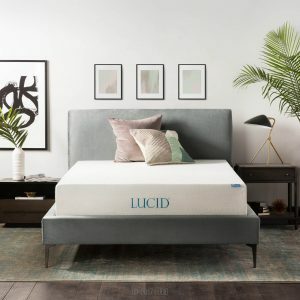 The LUCID 10 Inch Gel Memory Foam Mattress combines layers of gel-infused memory foam with high-density memory foam to offer an easy night’s sleep. The ventilated gel foam optimizes the flow of air, making this mattress a cooler option than others. The top foam layer prevents heat buildup using microscopic beads of gel. The “open cell” structure of the LUCID gel memory foam mattress also makes this model last longer than others. A soft, breathable cover made of a polyester blend also assists air flow. However, some consumers report that the mattress becomes saggy before the end of the first year of use. In other cases, the mattress lost its rigidity after about four years. The LUCID 10 Inch Gel Memory Foam Mattress comes with a manufacturer warranty covering 25 years after purchase. It’s hard to find a better guarantee against defect. Though the 10-inch-thick mattress isn’t as comfortable as some others, its multiple layers of memory foam include gel-infused foam with an open cell structure perfect for promoting breathability. The Best Price Mattress 10-Inch Memory Foam Mattress offers three layers of memory foam for your comfort. The first 3-inch layer is infused with charcoal. The second 2-inch layer is equipped with a pressure relief system, making it comfortable for sore backs and joints. This pressure relief system is a particular selling point. Areas around the shoulders and hips are more pliable, allowing the mattress to accommodate these pressure points. Your weight will distribute evenly, relieving pressure points and reducing motion transfer. The third 5-inch layer is made of high-density foam to support you and your partner while you sleep—though this mattress is a full, and might be more comfortable for one sleeper. This mattress reacts to the temperature of your body, remaining somewhat firm until the heat of your body prompts the mattress to mold itself to your shape. However, the fire-retardant top layer is made of fiberglass. If consumers remove the cover and wash it, that cover will be contaminated with shards of fiberglass. Other fabrics may also become contaminated with fiberglass, which can be a major health hazard. 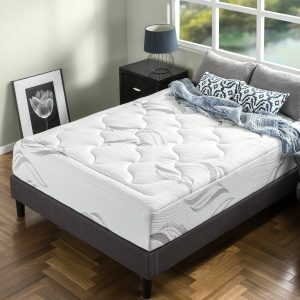 The Best Price Mattress 10-Inch Memory Foam Mattress prioritizes the relief of pain and pressure, using a unique combination of memory foams to make the areas around shoulders and hips more pliable. As a result, your weight will distribute evenly and put less strain on your pressure points. However, it’s of some concern that the mattress contains fiberglass. The mattress is also only 10 inches thick and full-sized. 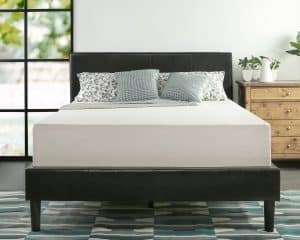 The Signature Sleep 12 Inch Memory Foam Mattress offers two layers: a 3.5-inch top layer of comfortable memory foam and an 8.5-inch layer of high-density memory foam. Thanks to this combination of soft and firm foam, your weight will distribute evenly, relieving pressure points and reducing motion transfer. The foam is free of flame retardants, ozone depleters, mercury, formaldehyde, lead, heavy metals, and other dangerous materials sometimes found in other memory foam mattresses. The Signature Sleep mattress is made with low VOC certified foam. The mattress ships with a washable cover made of soft, breathable fabric that prevents heat buildup. All materials optimize comfort and are eco-friendly. The Signature Sleep is also a 12-inch thick, king-sized mattress, making this one of the larger options available. However, some consumers report flaws in the compression technique used to ship this memory foam mattress. The Signature Sleep mattress will not decompress properly, even after several days more than the recommended waiting period. Mattress decompresses poorly after shipping. The Signature Sleep 12 Inch Memory Foam Mattress is one of three king-sized mattresses reviewed here on this list. At 12-inches-thick, that makes this one of the larger memory foam mattresses available. The layers of memory foam are made of eco-friendly and safe materials, without any of the dangerous additives found in some other memory foam mattresses. Though the mattress may not decompress properly, its system of weight distribution is likely to relieve the pain caused by traditional mattresses. 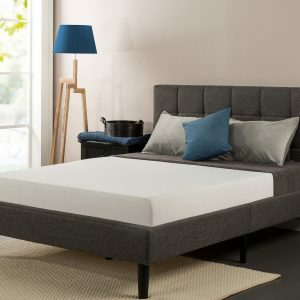 The Olee Sleep 10 Inch Gel Infused Layer Top Memory Foam Mattress contains three layers: a layer of soft memory foam, a layer of gel foam, and a layer of high-density memory foam. The top layer will support your weight and maintain the shape of your body. The second layer collects the heat from your body and disperses it, maintaining a cool and constant temperature throughout the mattress. The third layer of high-density foam prevents the mattress from sagging or losing its firmness. The Olee also comes with a 10-year warranty against manufacturer defect, which lends a certain confidence as to its quality and long-term sustainability. However, consumers report that the mattress may smell bad due to the chemical makeup of the layers of gel and memory foam. The mattress may smell toxic or release fumes. 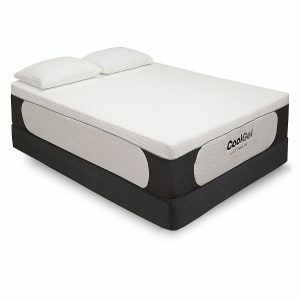 The Olee Sleep 10 Inch Gel Infused Layer Top Memory Foam Mattress adapts to your body temperature for a cool night’s sleep. With a 10-year warranty against manufacturer defect, this is one of the safer options to purchase. Though the mattress may smell worse than others, its layers of soft memory foam and temperature-distributing foam help to give you a good night’s sleep. 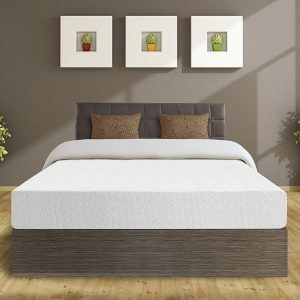 The Modway Aveline 8″ Gel Infused Memory Foam Queen Mattress is an open cell memory foam mattress. Though it is only 8 inches thick, the open cell construction helps align your spine and reduce the typical pressure on your hips. The Modway is especially useful for those who sleep on their sides. The Modway also reduces motion transfer between sleeping partners, making it easy for two people to sleep comfortably beside one another. The top layer of the mattress is infused with cooling gel. The gel reduces sweat and perspiration during hot or humid weather. The foam is free of flame retardants, ozone depleters, mercury, formaldehyde, lead, heavy metals, and other dangerous materials sometimes found in other memory foam mattresses. The Modway mattress is made with low VOC certified foam. However, consumers report that the mattress may smell bad due to the chemical makeup of the layers of gel and memory foam. The mattress may also smell of mold. The Modway Aveline 8″ Gel Infused Memory Foam Queen Mattress uses an open-cell construction that aligns your spine and caters to people who sleep on their sides. It reduces motion transfer between partners and reduces sweat and perspiration due to a top layer of cooling gel. The foam is made of eco-friendly, safe materials and includes none of the dangerous additives sometimes found in other memory foam mattresses. Memory foam may not be perfect for everyone. Some people experience more back pain after sleeping on a memory foam mattress. Others swear by the mattresses and insist they relieve pain. In all cases, it’s best to know as much as possible about what makes the best memory foam mattress before purchasing one for yourself. Determine who is most likely to be sleeping on your mattress, and choose your size accordingly. Memory foam mattresses also come in a variety of thicknesses, in addition to lengths and widths. The thickest mattresses are the most comfortable. The thicker the mattress, the easier it is to sink comfortably into the memory foam. Memory foam mattresses typically range from a thickness of 6 inches to 14 inches, with an average of 10-12 inches in thickness. Though thicker mattresses are typically more expensive, if back pain is your chief concern, the extra layers may be worth your investment. Memory foam mattresses can be made from several different materials. Most mattresses include petroleum, which can produce a terrible smell. However, memory foam can also be infused with different materials to reduce chemical smells or aid in breathability. Materials often found in memory foam include charcoal, green tea, aloe vera, plant oil, seed oil, and bamboo. These additives often help make memory foam mattresses cooler while you sleep. Unfortunately, some memory foam can contain dangerous or toxic additives. Beware any memory foam mattresses that contain flame retardants, ozone depleters, mercury, formaldehyde, lead, heavy metals, or fiberglass. Memory foam reacts to the temperature of your body. When it feels the heat coming off of you, it softens, allowing you to sink into it. However, this also traps your body heat between you and the foam. The best memory foam mattresses include a layer of gel memory foam. Traditional memory foam retains heat. When memory foam is made with gel, or when a mattress contains a layer of gel-infused memory foam, you’ll have an easier and cooler time sleeping. Memory foam can be low-, medium-, or high-density. The higher the density of the foam, the less likely it is to soften or sag beneath you. Most memory foam mattresses are not single blocks of foam. The best memory foam mattresses combine layers of foam with varying densities. Ideally, the base of the mattress will be made of high-density foam. High-density foam increases the sustainability of the mattress and reduces the likelihood of sagging or permanent indentations. Upper layers of memory foam mattresses come in varying thicknesses and makeups. Most include a layer of gel-infused foam and a layer of low-density foam, allowing you to sink easily into the mattress without trapping too much heat around you. Firmness is a different measurement than density. Firmness is measured by a foam’s “indentation force deflection” or IFD rating. IFD measures the force required to make a one-inch dent in the foam. IFD ratings range between super soft—a rating of IFD 10—and semi-rigid—a rating of IFD 12. Most memory foam mattresses are rigid, with an IFD rating between 12 and 16. A foam with a higher IFD rating but lower density foam can feel softer when compressed. Please refer to the following FAQ section for more information on the history and maintenance of memory foam. Memory foam was invented by NASA in the 1970s. It was originally called “slow spring back foam.” It was also known as “temper foam.” NASA sought to improve seat cushioning and crash protection for pilots and passengers on airplanes. Memory foam was originally too expensive for widespread use or application. Since memory foam’s invention by NASA, it has been applied to mattresses, pillows, helmets, shoes, blankets, and many other commercial and consumer products. Memory foam usually contains polyurethane, along with other chemicals and materials that increase the density and viscosity of the foam. Memory foam was originally made by NASA. They fed gas into a polymer matrix, creating an open-cell solid mass. The memory foam matches pressure against it but slowly springs back to its original shape when released. A new version of memory foam was invented in 2006. By infusing gel particles into the viscous foam, manufacturers reduce the foam’s tendency to trap body heat. The gel also reduces the time for the foam to spring back and makes mattresses feel soft. When should you replace your memory foam mattress? The durability of a memory foam mattress depends on the quality of the materials and the frequency of use. You’ll need to replace a memory foam mattress in a guest bedroom with less frequency than a mattress in a master bedroom. However, it’s recommended that you replace your memory foam mattress every seven years to ensure the best sleep. If purchased online, most memory foam mattresses are compressed and vacuum-packaged before being shipped to you. When the mattress arrives, you’ll need to unroll it and spread it out on a flat surface. Release it from its vacuum-packed plastic, and allow the mattress at least two days to decompress. Check the instructions from each manufacturer. Some mattresses will require more than two days to decompress fully and properly. If you do not let the memory foam decompress, it will not function as it is intended to function. Memory foam can be manufactured with several different materials, and these materials determine whether a mattress is hypoallergenic. Mattresses made of higher-density foam are more likely to be hypoallergenic, as dust mites have less opportunity to work their way into the tight-knit foam. When in doubt, a hypoallergenic mattress cover can fit over a memory foam mattress and ensure a good night’s sleep for those with allergies. Memory foam mattress emissions may cause respiratory irritation. Because it is made with polyurethane and petroleum, memory foam mattresses are more combustible than traditional mattresses. For this reason, many manufacturers include flame retardants. However, adding flame retardants can often be dangerous and cause more problems. Some manufacturers include fiberglass as a flame retardant. Because fiberglass is made of small, sharp glass particles, these mattresses can cause skin and stomach irritation. It can worsen asthma and other respiratory problems. It’s recommended that children and infants not be permitted to sleep on memory foam mattresses. Children may find it difficult to turn over. They may suffocate. Long-term exposure to emissions from flexible polyurethane foam products may cause damage to the central nervous system. It may cause headaches, dizziness, nausea, or memory loss. These emissions may also affect the liver, kidney, or cardiovascular system. Mattresses that meet Certipur-US® standards contain certified flexible polyurethane foam. If you are concerned about the potential risks associated with memory foam mattresses, look for those that meet Certipur-US® standards. These mattresses do not contain the dangerous additives included in many memory foam mattresses. However, most Certipur-US® mattresses also do not contain flame retardants. As stated previously, flame retardants can reduce the combustibility of a mattress, but they can also present other health hazards. Memory foam mattresses are more supportive than traditional innerspring mattresses. If you suffer from chronic pain, particularly hip or shoulder pain, memory foam can help relieve that pain. Your sleeping position can also cause back pain or relieve it. If you sleep on your side often, you’ll want a mattress that provides a lot of pressure relief for your hips, knees, and other joints. A memory foam mattress will conform to your shape. If you sleep on your stomach, you likely won’t enjoy a memory foam mattress, which might threaten to suffocate you. If you’re tired of feeling tired in the morning, a memory foam mattress may be a smart solution for you. The best memory foam mattresses are thick, multi-layered, and come with warranties against manufacturer defect. Prepare for a bit of an odor, but look for mattresses that use eco-friendly additives to fight against toxic, chemical smells. Memory foam mattresses can help your body realign and reduce the pain caused by your pressure points. Our reviews, buyer’s guide, and FAQ should serve to eliminate any confusion or questions you may have.